It gives a concise background story of the heroine to audiences that may not be familiar with her. Our heroine, played by Gal Gadot, grew up on an island paradise and was trained to be a warrior. However, she had no idea just how powerful she really was. Thus begins her story. I appreciated the timeline of the trailer because it made it easier to follow the plot. It starts with our heroine as a young girl in training to be an Amazon warrior. She becomes known as Princess Diana. Then she learns of war in the outside world and leaves her home to fight for peace. 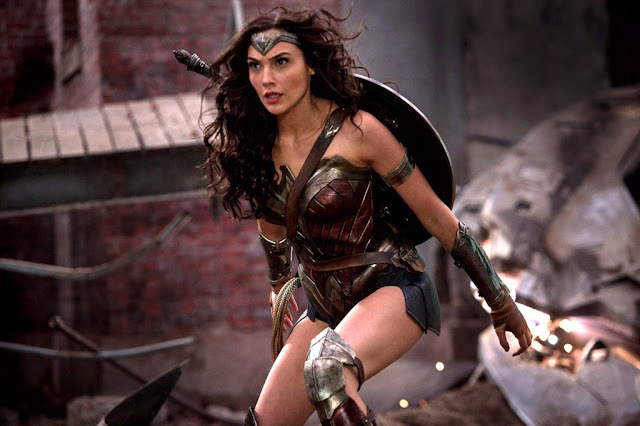 Wonder Woman's stunts and fight scenes are great and gives me more of a reason to watch the film. I'd like to know if Gal Gadot did her own stunts or had a stunt double. Nevertheless, the stunts were well-done. The opening scene was beautiful to watch because the scenery was breathtaking. The scenery is important to me because it caught my attention and made me want to see more. The women riding on horseback were lovely and her home really does look like paradise. The trailer's turning point was when an American pilot, Chris Pine, ends up on the island. Wonder Woman rescues him and he tells her of the horrible war going on. This is the moment when our heroine embarks on the journey to find her true destiny and save the world.